If you would like an implant to replace missing teeth, Dental Healthcare Practice can see you for a consultation to discuss your requirements. Before proceeding with implant treatment you will have an itemised and costed treatment plan. If you are happy with this we can start your treatment as quickly as 6 weeks later and you could have your new tooth that you can confidently chew on. Dental Implants are one of the most successful treatments in dentistry; they create the closest solution to a real tooth possible. They are the longest lasting of treatments too, which enables the patient to enjoy natural feeling teeth for a very long time. We are very fortunate to have the services of Dr Fadi Barak, a Specialist Implantologist who has successfully placed over 1,000 dental implants in his career. Dr Mark Setters BDS has been restoring dental implants since 1995. We are one of West Sussex’s most experienced practitioners of dental implants and we are happy to talk you through the details, so don’t hesitate to get in contact with us. Dental implants are the closest thing to being given natural teeth with all the benefits that provides. They are a very hard wearing and long term solution. Ultimately they can also be one of the most cost-effective treatments because they last for an extended period, meaning you can avoid regular fees for additional dental work. 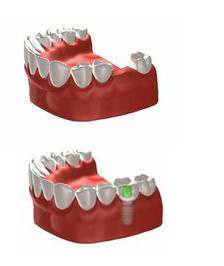 Dental implants are one of the most successful treatments in dentistry. But they do require that they are planned and designed for your individual situation, in order to be successful. This is one our areas of specialism and all our implants come with a guarantee. The quality of the implant is paramount. We use Straumann implants, as they are one of the world’s largest manufacturers with a network in over 60 countries. They are manufactured in Switzerland to the highest engineering standards in the world. For dental implants in Horsham, West Sussex contact us today to discuss an implant treatment plan.